On Site: Big & Small Game Hunting, Target Shooting, Equestrian, ATV, Camping, Wildlife Viewing. Private Access into adjoining BLM Lands for Rock Climbing, Fishing, Additional Hunting, Equestrian, Hiking & Camping. Access: Maintained Year-Round. Gravel County Road to Private Gravel to Driveway. Bulls-Eye Cabin hit your target with this rustic log cabin situated perfectly for mountain recreation and weekend escapes! Designed for the entire family, it has an unpretentious, down-to-earth vibe - the ideal place to kick back and relax. Surround yourself with its many charming and creative touches. The upper loft level includes a master suite with outdoor deck/balcony and spacious bath. The open main level has a well-arranged kitchen and casual dining nook with a cozy woodstove. The lower level offers an area for games and additional bedroom/bath with a unique aspen-framed entryway. 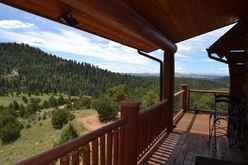 Enjoy views of the surrounding mountain scenery on a walk-out and elevated, wrap-around deck. Experience the magic from sunrise to sunset and into the starry evenings! To the west is the pastoral Fourmile Valley, dotted with livestock, verdant meadows and meandering Fourmile Creek. The south view is the impressive and snow-capped Sangre De Cristo Mountains. Westward you will be delighted by the brightly colored aspen foliage atop Mt. Pisgah. Tucked into a private mountain valley, the Bulls-Eye Cabin not only borders BLM but has additional private access into expansive BLM Lands with a diverse collection of wildlife (elk, mule deer, bear, mountain lion and turkey). Explore, hike and fish the year-round Bernard Creek, scale the rocky bluffs of the canyon walls, track & hunt trophy game or discover the many other hidden treasures in this special place of nature. Located 1½ hours west of CO Springs and less than 20 minutes from the historic gold mining town of Cripple Creek. Bulls-Eye Cabin offers the best of all worlds - a mountain escape with privacy & exclusion; close proximity to a charming mountain community (small stakes gaming, groceries, restaurants, hotels, melodramas, museums) and nearby skiing, river rafting, boating, shopping, medical care and airports. 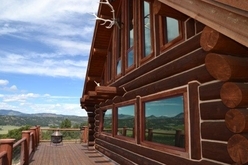 Bulls-Eye Cabin brings the whole family together to enjoy a great Colorado outdoor adventure!